We are unable to find iTunes on your computer. 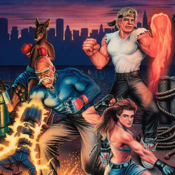 To buy and download Streets of Rage 3 by SEGA, get iTunes now. I now have all the Streets Of Rage games that SEGA has produced within the last 15 - 20 years. It's truly an honor for me to thank SEGA for letting Apple let their customers download and play such classic games on such affordable prices. And to Apple, for bringing back such great and noble games that truly brings back my childhood memories. Thank you. Finally! Now they're all here, what to ask for now. This is my favorite game series of all time. How about adding Sonic 3, then sonic & knuckles and make it attachable some how to the other sonic apps. And whoever is thanking Apple in the reviews, don't, thank Sega. © 2009 SEGA. All Rights Reserved.